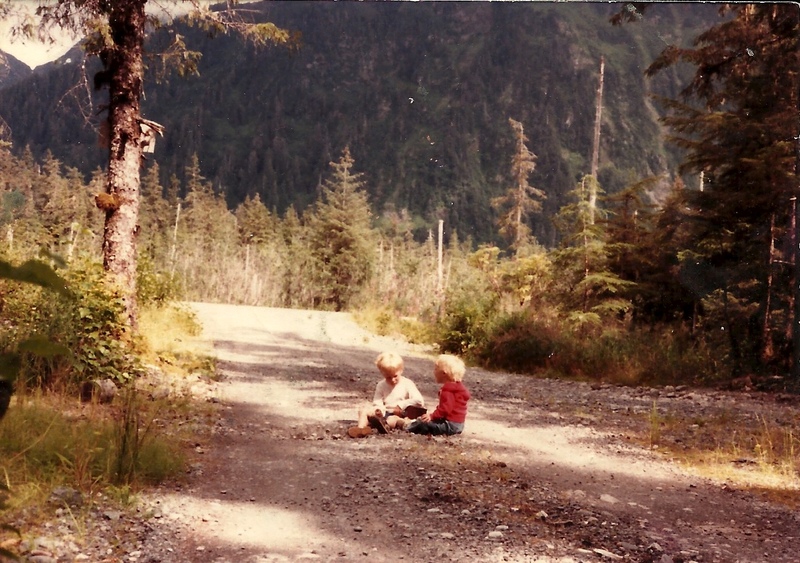 Lost in Alaska, 1984. They loved it. I did not. Mire (noun): wet, slimy soil of some depth or deep mud. (Verb): mired, miring: to plunge and fix in mire; cause to stick fast in mire,to involve, entangle. December 29th. I don’t know why this date stuck, because I never got a chip or token, but it did. I counted back the years. 1985; twenty nine years ago. My memory of that day begins with a hangover, the kind that feels like your brains are pushing your eyeballs out of your head and your knees feel like play-do. Two boys and their bicycles and a red pick up truck. It was cold in Wellfleet Massachusetts and it didn’t help that the parking lot ended at a steep sand dune, then the ocean, battle ship gray and angry, sending a wind across the pavement that went right to your marrow. I doubt I felt the cold as I watched the two little blond heads circling on their bikes, yelling to each other, one age five on his two-wheeler and the three year old on the Big Wheels, spinning out in the sand. The whole gang, including the guy with the eggs, or rolls. Joseph missing still, maybe getting milk or a nap. 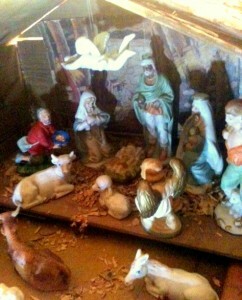 I still remember the little nativity figures crowded together in the cardboard barn. What a strange mishmash of people, and animals too! After I got big, my mother told me they were nothing special, my parents bought the set at Woolworth’s, but to me they were like fine porcelain. There was something about the odd gathering that drew me. There were two angels, one flying and one standing and three kings with brightly painted robes and gold gleaming from their turbans and in the gifts they held. The tallest one had very dark skin. Then there were two or three shepherds; one with a lamb across his shoulders, another with a staff and a beggar with a basket of yellow balls that my dad said was bread but it always looked like fried eggs to me. And of course Joseph .and Mary, probably the only inconspicuous ones of the odd assembly. I would return to the cardboard barn set up in the living room countless times during December, gently rearranging their positions; the shepherds might be in close next to Mary and the kings were on the outer tier, or maybe a king would be hovering over Joseph’s shoulder, and an angel would be huddling with a donkey. But they were all looking…at the floor really. Baby Jesus was stashed away, actually I could see him hanging out on the mantle over the fireplace, hidden in the evergreens, until Christmas day. It took some years for me to get it…like, duh, it’s his birth-day. And even though the whole group kept the same silent expression after baby Jesus made his debut into the manger when my father rescued him from the mantle, it all just seemed to come together to me, finally. They were all looking at HIM! Even then I suspected this was more meaningful than Santa’s half-eaten cookie. I still have several of those pieces. Over the years the barn had to be rebuilt, although it has the original cardboard barn scene glued to the back wall, the stacks of hay and cows turning a warm sepia over the years. Pine needles were glued to the roof and we threw some wood chips across the stable floor, spilling out onto the table it stood upon. Joseph’s head broke off, then he disappeared, giving way to single-mom jokes when my kids were teenagers. Some animals were added and I think a few other odd pieces that have blended well with the Woolworth’s guys. I watched each of my children draw near to the makeshift little stable in the same way I did as a child, curiosity on their small faces as they beheld the strange little gathering, year after year, unwrapping them carefully from their newspaper hibernation and arranging the scene with a sense of wonder. What child is this? Draw near to God, and He will draw near to you. James 4:8 NKJV. I like also how the NLT version goes: Come close to God and He will come close to you. I love to ponder all of the creative ways God used to draw me close to Him, from a cheap nativity scene, to a retired preacher on an island off the southern coast, through paralyzing loss and the humiliation of sickness, and often through my own children and grandchildren and their honest quest for Jesus in their own hearts and lives. Maybe if Jesus was born today, he would pick a homeless shelter. It’s not that he would come just for homeless people any more than he came then for just shepherds, but it would have to be a place that he could draw everyone to, and that everyone can get in, no matter how you dress or talk or smell. Looking around at church I think of that odd little nativity scene crowded with kings and beggars and angels. He knows we are just like those shepherds that knelt on the smelly barn floor two thousand years ago, next to the angels. We are ex-cons, drug dealers and drunks sitting next to financial consultants, teachers and antique dealers, each heart alive with hope and expectation, turned to the same place, looking to Jesus. We are African-American and Hispanic, Czech and Australian, from brand new to 95.And we are transformed by the power of His love, riveted still by His glory and reminded of what a great price He paid to ransom us, the people of God. “I bring good tidings of great joy…” Some things haven’t changed at all since the first Christmas. Draw near, real close to God, and He will draw real close to you.